Cooling and calming, forward bends are introduced at the beginner level. For beginner students forward bends can seem approachable because for one, they are not particularly scary. However forward bends can cause or irritate an intervertebral disc injury, reduce circulation to the lower body and bring on a depressed mind state. As teachers, forward bends, especially seated forward bends, require more energy to teach as students can become tamasic (sleepy) and introverted, often focused on their physical restrictions and discomfort. This is unlike the standing or back bending asana that invite in the breath and a mental state of empowerment. Why is this? Begin by looking at the more obvious annamaya kosa* outer structure, tight, short hamstrings, gluteus maximus and restricted joint capsule can restrict forward flexion at the hip joints. 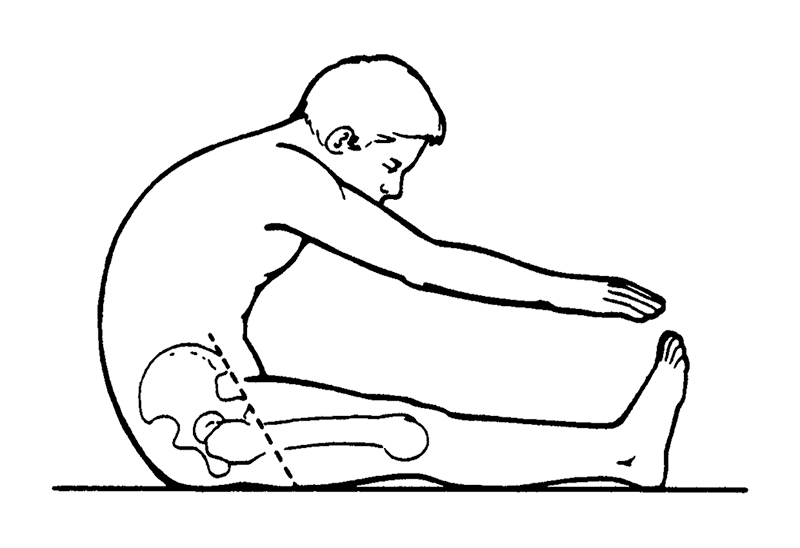 Not only are the hamstrings extremely sensitive for many newer students to yoga but when short hamstrings pull on the ischial tuberosities, also known as the “sit bones” they force the pelvis into a posterior pelvic tilt and force the lumbar spine into excessive flexion, compromising intervertebral discs. What we want to see is a lengthening and neutral lumbar spine (image 1). But beginner students do not yet know this, add to this the beginners mind desiring to reach the finish line, in this case the feet, and a forced, painful pose ensues. (image 2). When we explore the pranayama kosa of this same pose what do we find? In the incorrect pose the flexed lumbar and thoracic spine are convex (dome shaped) making the anterior trunk into a cave. The chest and abdominals are shortening. Can this person breathe? 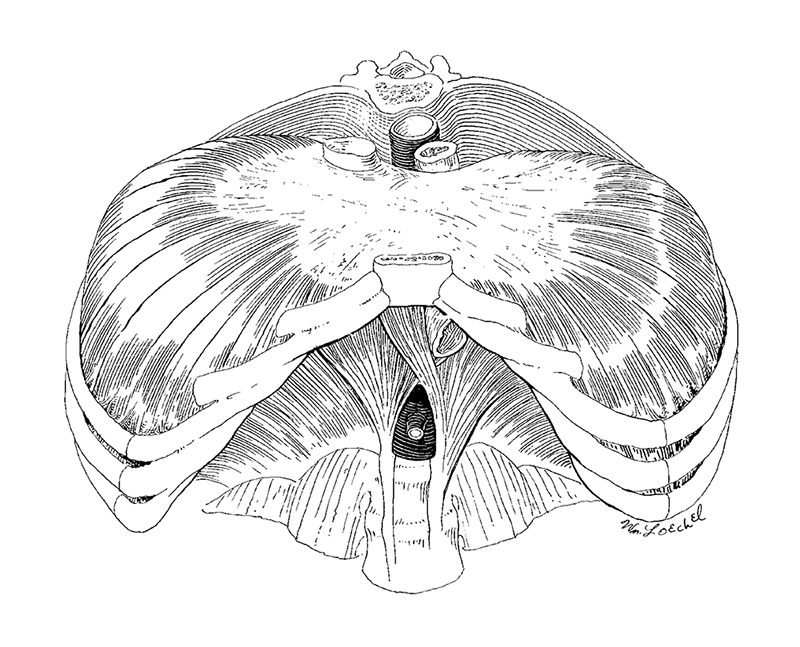 The diaphragm muscle separates the thoracic cavity from the abdominal cavity and is pierced by three structures, the descending aorta, the inferior vena cava and the esophagus (image 3). When the anterior torso is in a concave, shortened position these structures can become partially occluded (pressed upon, causing them to close or partially close) resulting in reduced blood flow to the lower body and decreased return of venous blood to the heart. Some of us have heard Geeta Iyengar speak on this. In addition, pressure on the esophagus can lead to heart burn and a hiatal hernia. The manipura chakra, centre of personal empowerment is being compressed and the anahata heart chakra is depressed and dropping hence a depressed mental state affecting manomaya kosa ensues. How do we ensure students enjoy the cooling calming benefits of forward bends without experiencing the negative side effects? In his wisdom Guruji BKS Iyengar experimented in his practice on his own body in order to feel what his student’s experience. Through observation he developed the application of props. From his svadhyaya we have all benefited. As a result, in Iyengar studios, the use of props are understood and this transmitted knowledge applied expertly by well trained instructors. In Iyengar classes students with short tight hamstrings sit on just enough height (firm blankets, blocks or a bolster) to maintain a neutral pelvis and allow them to lift the spine, maintaining a normal lumbar curve, and are taught how to fold from the hips. A belt is given when needed to help students reach their feet without rounding the spine. For students with very tight short hamstrings an upright torso position may be their full pose and the healthiest position for their spine, heart and other organs. Once realized, a correct posture can cultivate healthy Kosas. With adept adjustments and support if needed forward bends are transformed from distressing to meditative. The result is students breathe more fully, do not strain and may even find their bliss in anandamaya kosa. Or as Prashant Iyengar would say “having taken the position now take the condition of the asana”. *Kosa is the Sanskrit term for the sheaths or layers of self, from gross to subtle. Through practice yoga aims to access the kosas. Yoga is most beneficial when studied in earnest with an experienced teacher; it is wise to consult a trusted health care provider before beginning any new exercise program. Forward bends must be modified or are contraindicated for pregnancy, osteoporosis, herniated disc, or other spinal conditions.